Reduce costs. Increase satisfaction. Improve efficiency. Designed specifically for small or medium-sized businesses looking to take advantage of Panasonic's reputation for quality technology, without needing a huge budget, the KX-NS700 unified communications solution is a small system with the ability to manage big future growth. Easy to install and maintain, it’s a cost-effective legacy and IP communication system for companies with up to 250 users in a single site that can be flexibly configured and expanded, making it the ideal alternative to cloud-based solutions. One flexible system. Multiple communications capabilities. The system has sufficient capacity for legacy and IP ports, and an activation key or expansion cabinet that can be used to expand the system when you want. It can even connect to the Panasonic KX-NS1000 system to create a small, medium and enterprise solution. The KX-NS700 can support the needs of supervisors in call centres, such as queue announcements, live status monitoring, activity reports, automatic conversation recording and Network Attached Storage (NAS). The system starts from only 6 extensions, up to 288 extensions with Expansion Units. It is also a unified communications system which has rich IP features, such as mobile linking, integrated voicemail and e-mail, instant messaging (chat), and presence information. The installer can easily programme everything related to functions such as PBX and VM, thanks to a built-in web server. Programming can even be carried out remotely. Proven solutions for a range of industries. To deliver outstanding customer service in the hospitality sector, your staff need the support of effective and always-available communications technology. The KX-NS700 offers both. Comprehensive system management, PC integration and the flexibility to provide mobile communications throughout your business mean you’re able to work more efficiently than ever before and your customers enjoy the most convenient, comfortable experience possible. 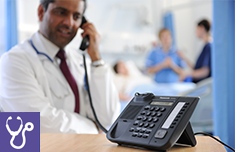 In healthcare environments, consistent, clear communications are critical. The KX-NS700 is a solution that allows your staff to access easy-to-use technology and remain in constant contact with other team members and patients or residents, wherever they are. Equally valuable is its ability to integrate with your existing care applications, such as emergency call systems. Perfect for supporting office functions across your business, the KX-NS700 incorporates mobile telephony, desk-based phones and highly configurable voicemail systems to ensure that staff stay connected, wherever they’re working. Combined, they improve functionality, reduce costs, simplify administration and enhance customer service. Dial Pulse (DP) 10 pps, 20 pps Tone (DTMF) Dialling with Caller ID (FSK) Port 1-2 (on pre-installed MCSLC4) support PFT in combination with the port 1-2 (on an LCOT6) connected to an analogue trunk respectively.